Review: Smile Brilliant LED Whitening Kit + Giveaway! When I received an email from Bryan of Smile Brilliant, I quickly checked the product he wants me to review about. After reading a couple of reviews about it, I immediately said yes to his offer of review. Who would say no to this offer? Imagine, a whitening kit that can whiten my teeth after how many minutes or hours only. I would dare to try this! So there I replied Bryan with an answer you already know from the start. For the directions on how to use the kit for the first time, I made a collage from the following photos found at Smile Brilliant website. When I first use the kit, I thought that it's easy if I will just follow the instructions. Well, not really. I feel that #4 should be done carefully to avoid the gel getting into the gums. I'm afraid it might cause infection so I was way too careful with the gel application. Hardest part is #6 where I need to wait for 40 minutes and can't talk to anybody. So better do this while watching movie or dramas during the evening. Unfortunately, I wasn't able to take photos of my gel application to putting on lip guard since I was in a hurry to do the first few steps because my saliva is accumulating. Haha. I managed to take a shot of this while waiting for 40 minutes to finish. Better do this on times when you don't have to talk to anyone. After 40 minutes, you can remove the LED then let the lip guard stay in place for additional 1-3 hours if you have more time. This is what I missed! I removed everything after 40 minutes so I think I won't achieve much result on my after photos, but look! I will be using the kit again this week and will update you with new photos. For now, what do you say with the result? If you want a Smile Brilliant Whitening Kit on your own, I have a giveaway for you!!! This is OPEN WORLDWIDE! You will receive the same kit I have which is worth $69.95 down to $39.95. Yours for FREE. NOTE: Follow the 11 mandatory steps on the Rafflecopter widget. What do you say with this whitening kit? Have you heard of the same product or tried it? Any thoughts you want to share, please leave it here. I would love to read 'em. Thank you for posting a review! Your teeth significantly whitened! I would love to try this too! Oh, and I want to join the giveaway. I'll join! Your teeth looks good after the treatment. By the way, will it make a difference sa veneers? This looks like a good product for a giveaway the participants would love to get this for their collection and use. Collection? What type of collection do you mean? Oh wow! 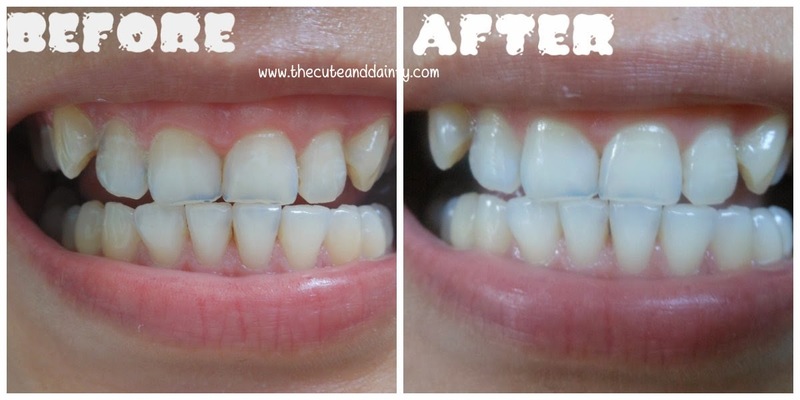 This application has indeed whiten your teeth and you didn't have to undergo any surgery. Yep. It saved me the hassle to go to the dentist and money as well. The whitening cream looks really effective. Oh wow! That's a significant change! I want to win this giveaway too!! this is something new and very convenient for mums like me... No need to go to the clinic.. I love this idea! OM! This is effective. I've been trying to whiten my teeth by using baking soda but it's a long process. I'm amazed with this product. Is the effect permanent? Since I only did it once, I am not sure yet but I think it is permanent if you will try to work on not staining your teeth and maintaining it. This made me remember of an episode in Friends where Ross had his teeth whitened. I think he did not follow the instructions and ended up with his teeth glowing in the dar. hehehe I bet that was just a joke. Cool post. Fantastic! I want to whitening my teeth too!! Rocking giveaway, thank you! Wow. This product is promising. Thank you for sharing! nice giveaway... It would be nice to win this prize. oh boy, I entered. I really need to win.. really want to. My teeth could use the help. I can't give up coffee and it does darken my teeth. .. why does this want to log me in as anon? I'm Debra S.! You can check if you are first log in to your email. Choose under the REPLY AS option, Google if you are already logged in. Also pls. follow instructions above. Thanks! Good luck! Wow, your teeth really whitened! Yes I guess so too! It really is effective, isn't it? I am not really a coffee drinker so I don't know about that. I guess yes because I drink soda often. However, I guess it is still better to maintained it because if it will be stained again, it will just go back to it's old state. Wow, if i'm not mistaken, this is the same product that sis Maan reviewed noh? Your teeth significantly whitened, sis! Nice! This is great review and the before and after photo is so awesome! I can totally see the difference. Wow, it really works :) Good luck to everyone who will join. I saw the difference! Ang galing ng product and good luck to the winner! Looks like it really works...seems like it's a long process but worth it. Yes I also believe it was kinda long but definitely worth the wait! Wow, it really works. How do you control yourself from accumulating saliva. The 40 minutes sound like a lifetime. haha! Difficult! I need tissue for covering and if ever there were some spilling. I'm joined because I relly want a white smile! Wow, never seen!!! Perfect!! i want pleeeeease!! I need win!! Great giveaway!!! Thanks!!! I was going to comment on your post about the LA Bake Shop cheese bread. I changed my mind because I realized I was never going to get the chance to have any of that yummy looking bread. Unless, I travel to the Philippines some day. Do you think they would deliver to America? LOL! Anyway, this teeth whitening kit looks like a lot of work. I am just too darn lazy. But, I do see a difference in your before and after pictures. Are you still using it? Your blog is very good i am impressed by the information that you have on this blog. It shows how well you understand this subject.